Now that spring has sprung it is an ideal time to look at what spring merchandise items you can use to support your marketing campaigns and help to grow your brand! With the new financial year beginning soon many businesses, including those of your clients, are looking at ways they can increase their sales, brand exposure and market share over the coming year. This makes it an incredibly important time of year to ensure your brand and message cuts through the noise and gets noticed. With this in mind any promotional products you invest in at this time of year need to be both effective and distinctive in order to set your brand apart from the competition. The importance promotional products can play in this is often overlooked but when it comes to spring merchandise, it is important to make every effort to ensure your investment has maximum impact. So, here’s our advice on how to make the most out of spring merchandise. 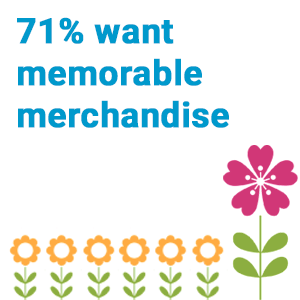 The British Promotional Merchandise Association asked marketers what they looked for when seeking out promotional products and found 71% wanted their chosen promotional product to be memorable. Despite so many wishing to invest in a unique and memorable piece of promotional merchandise, 58% said they struggled to find items that match this criteria and 32% said they feel promotional products lacked creativity. We’ve found spring merchandise to be some of the most quirky and fun. This is also something that correlates with the BPMA’s research where ‘flower seeds’ came out as one of the most unusual items respondents had been given. We all love a bit of greenery in the office and spring giveaways such as our Eco Plant Cube or Bio Pots ensure your clients continue to interact with your branded promotional products on a daily basis as they watch their spring merchandise bloom and brighten up their office. It definitely makes for a more memorable piece of merchandise than your standard printed pen. We’ve mentioned a few times before that useful promotional products are highly valued and consistently come out as the top ranked quality that makes up the perfect promotional product. However, an often overlooked aspect when selecting promotional products is the fun factor! Despite the focus on useful qualities, fun is also one of the highest ranking qualities that is perceived to make the perfect promotional product. We think your spring giveaways don’t have to be a choice between useful and fun, with some spring merchandise options offering both of these qualities. Take our Sprout Pencils which offer all the practicality of your everyday pencil but, when they’re too short to use, can be planted in a pot which will later flourish. Similarly our Seed Paper Bags have the regular usage of any paper bag but with the added novelty of being able to watch your branded bag bloom when you’re finished with it. Simply add soil to bring your brand to life. 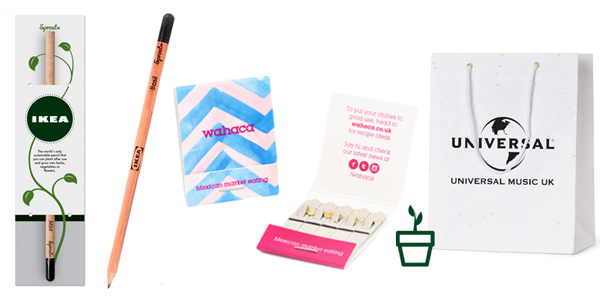 These kind of spring giveaways not only inspire fun but they can also be used as a tool to convey the message that your brand is environmentally aware and taking steps to be eco-friendly.